Corey Abramson’s book, The End Game: How Inequality Shapes Our Final Years, takes readers on a journey through geriatric inequality to show how on the west coast of the US the supposed golden years of post-employment for many individuals is an illusion, and in reality retirement is a corrosive quotidian struggle on body and soul, writes Michael Warren. The End Game: How Inequality Shapes Our Final Years. Corey M. Abramson. Harvard University Press. 2015. “I just sit around all week dying, and watching others waiting to die” is one of the many candid melancholy admissions by aged interviewees in Corey Abramson’s The End Game: How Inequality Shapes Our Final Years. Abramson takes readers on a journey through geriatric inequality to show how on the west coast of the US the supposed golden years of post-employment for many individuals is an illusion, and in reality retirement is a corrosive quotidian struggle on body and soul. However, the saddening tone of this ethnographic work serves many purposes by shedding light on: the effects of social networks; rationalisations behind decision-making; greater understanding of general social stratification; and the symbolic as well as practical challenges of growing old in the US. The End Game has been produced from two and a half years of fieldwork in four neighbourhoods of the California Bay Area whilst Abramson was a PhD student at Berkeley (he is currently Assistant Professor of Sociology at the University of Arizona). The book takes its title from using facets of baseball to explain inequality in the latter years of American lives. Even for non-baseball aficionados like me, the analogy works. In fact, bafflement at baseball is the desired effect! For it is only when Abramson watches a baseball game with an interviewee that he realises in spite of knowing all the parts of the game, he only has a ‘superficial’ understanding and did not fully comprehend baseball’s ‘connections between the players, team dynamics, rules, strategies, individual backstories…’. Accordingly, the book is organised into five sections alluding to the game: “(1) Who gets to play, (2) the rules of the game, (3) the shape of the playing field, (4) the strategies of the players, and (5) team dynamics”. Where Abramson frequently succeeds is in showing how individuals who are in drastically similar circumstances act in profoundly different ways. For example, the academic presents two women who face breast cancer with ‘nearly indistinguishable’ backgrounds, ages and material resources yet approach the ailment in opposing ways (one religiously attends chemotherapy, whilst the other often skips chemotherapy appointments). Abramson delves deep into cultural orientations and motivations which brought the two to such differing opinions, and in doing so begins to challenge many of the long-held stereotypes attached to becoming a geriatric. The reader encounters elders with a propensity to devour ice cream after weight loss surgery, heavily drink alcohol and consume marijuana. Abramson shows that these are not simply reckless hedonists, but can be ‘educated and articulate’ and consciously choose to skip chemotherapy in a bid to maximise enjoyment in their few remaining twilight years for valid reasons (as the reader learns when they vividly read of the stress of simply keeping up with a healthy regimen). Image Credit: Hugo Chisholm. Flickr. CC-BY-SA 2.0. In a similar vein to a good cartographer, Abramson maps the archipelagos of social networks and how they help seniors prosper both in terms of economics and happiness. Seniors with a dense network of family and friends often fared better in the ageing process, as they could count on those relations to give them lifts to destinations and deliveries of food, engage in conversation, and other actions that are taken for granted by younger citizens. When the archipelago of friends is minimal around an elderly person, life becomes tougher. For example, they are forced to take a bus to obtain required items. It is a testament to Abramson how well he portrays the draining effect of taking the bus, or the act of waiting for a clinic operative to provide older citizens with the necessary drugs that can be more easily procured by wealthier geriatrics or those with strong social networks. He succinctly observes: ‘While being forced to wait is an inconvenience for a healthy person in middle-age, for seniors with limited energy, waiting an extra half hour is not only anxiety-producing but potentially dangerous, because having less available energy increases their chance of a fall’. It is not uncommon that seniors with smaller social networks are poorer and are trapped in a vicious circle where they cannot afford to go out and meet other people or hire the necessary helpers to aid them, and are thus sent into a spiral of further unhappiness and isolation. There is some solace though in that the existence of a social network does not necessarily mean it will be advantageousness. In fact, one interviewee found her family to be a continual source of stress where her brother forced her to move out of her mother’s house. 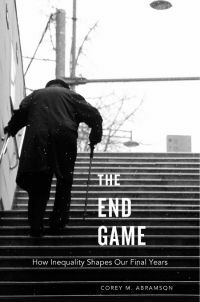 On finishing The End Game, the reader will be shocked at the dichotomies and dark ironies which plague the affairs of those ageing in California. For example, the most successful non-profit organisations with highest numbers of volunteers are often based in the leafiest neighbourhoods of a city serving the more affluent pensioners. The non-profit organisations in poorer areas were more informal and less adept at gaining federal grant funding than their affluent cousins. Understanding how this is intertwined with other factors affecting elderly lives (or the ‘overall game’ to use Abramson’s analogy) is a recurrent accomplishment throughout book. One wonders (as Abramson alludes to in his methodology) how much more difficult life is in colder states like Michigan or states with more extreme challenges; there is certainly scope for expansion of study. Readers who enjoyed this should also look to get a copy of Katherine Newman’s A Different Shade of Gray which explores similar issues but on the eastern US seaboard. Avoiding reductionist frameworks and showing the hugely varying lifestyles of Californian seniors, The End Game poses a profound question: how can provision of services for the elderly cater for individual circumstances and not merely treat the aged as one grey block? Abramson eloquently and comprehensively expounds this complex question, but an adequate answer is still in larval stages both in the book and society at large. This post represents the views of the author and not those of Democratic Audit or the LSE. Please read our comments policy before posting. It originally appeared on the LSE Review of Books. Michael Warren completed an MSc in Empires, Colonialism and Globalisation at the LSE in 2012, having graduated from the University of Sheffield (studying on exchange at the University of Waterloo, Ontario) with a BA in Modern History in 2011. He has researched as part of an open data project for Deloitte and the Open Data Institute, and worked for the All-Party Parliamentary Health Group. He is an Analyst at Accenture.